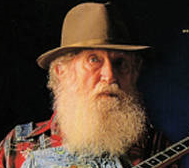 DSH: Thanks for the recommendation. I just picked up Part-Time UFO! Bone: Fantastic review. I adore Lunar, and am glad to see that you do too. 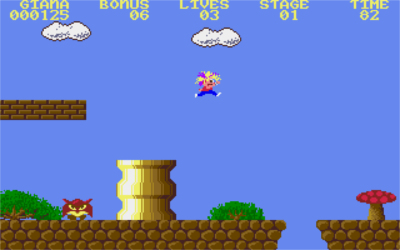 Super Adventure Island is about as “SNES launch-y” as SNES launch games get. Gratuitous “Mode 7” effects? Check. Glossy 256 color graphics at all times? Check. Rockin’ MIDI music? Check. Slowdown? Check. Simplistic game design that feels like it was rushed to make a launch window? Check. From a gameplay perspective, Super Adventure Island feels like a step back from Adventure Island II/Adventure Island (GB). There are no dinosaurs, and the game is drastically shorter than any of its predecessors. (It is also the first game in the series to feature limited continues, probably to make sure people spending $50 in 1992 dollars on it didn’t feel ripped off.) Nonetheless, it looks great, and it still has one of of the system’s best soundtracks. Moreover, it controls wonderfully, which is apparently pretty novel for the series. So, it is ultimately a harmless, pretty fun action platformer, and I recommend it to anyone seeking a short, basic, good looking 16-bit game. You going to check out Super Adventure Island 2? That's the only one I've played and it was pretty neat and unique. For Lunar, what's so bad about the PSX version? You say the "anime" is a plus Bone... the PSX version is anime to the max. I thought I generally always heard the PSX version of 1 is the best but for 2 the Sega CD version might be better, since they change the leveling/magic system or something in there. Did another REmake run today... got that Infinite Rocket Launcher unlock! (beat it under 3 hours). 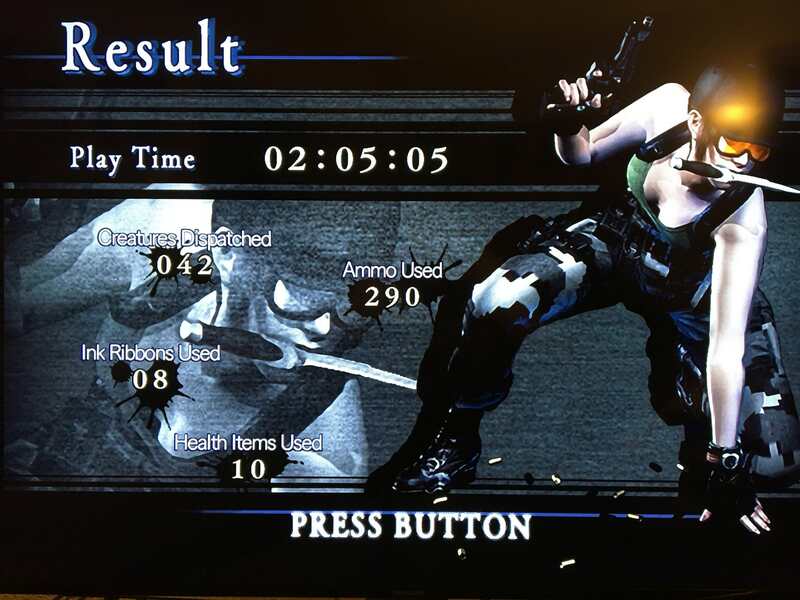 It helps to know that cutscenes count against the time, so skip them. Now I'll work on Real Survivor mode with Chris which has been brutal so far. Hopefully I can knock it out and check out the Invisible Zombie Mode. Xeogred wrote: You going to check out Super Adventure Island 2? That's the only one I've played and it was pretty neat and unique. I have read that Super Adventure Island 2 is good and very unique. It was released the same year as the last game in the Monster World Series, and it will be interesting to see how the two series compare when I finish my run through them. It's always weirded me out how the main character looks like a bootleg Mario. Is that a localization thing? Xeogred wrote: It's always weirded me out how the main character looks like a bootleg Mario. Is that a localization thing? I always thought he looked like he was about to cr*p his pants. the facial expression paired with the constantly moving legs make me view the entire series as one mad dash to the bathroom. Who was, apparently, pretty awesome at shmups. Who knew? I said earlier that it holds up well and I still think so, although it overstays its welcome a bit towards the end with a couple of duels in a row and mostly repeated enemies and puzzles. This is perhaps the earliest 3D platformer (/TPS/FPS) that does, which is certainly an accomplishment. See the TR ladies' night thread for my comment on this one. Xeogred wrote: For Lunar, what's so bad about the PSX version? 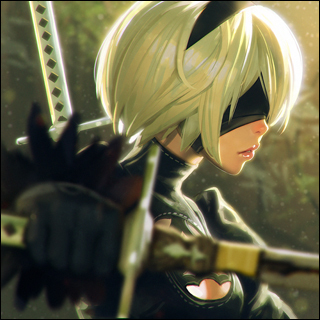 You say the "anime" is a plus Bone... the PSX version is anime to the max. I thought I generally always heard the PSX version of 1 is the best but for 2 the Sega CD version might be better, since they change the leveling/magic system or something in there. Oh, the PSX version is a lot of fun. I just prefer the old school original. Wow, just get a load of that cover art. It's almost as if the box art for Mega Man had a sister ... and she wasn't too keen on wearing bras. This game is a bit notorious as being a straight rip-off of Super Mario Bros., but that's plainly ridiculous. You see these sisters aren't super; they're great. They're not brothers with vaguely Italian sounding names, they're sisters ... with vaguely Italian sounding names. Clearly this game is not derivative in the slightest! No … but in all actuality, this game really does steal most of its mechanics from Super Mario Bros. 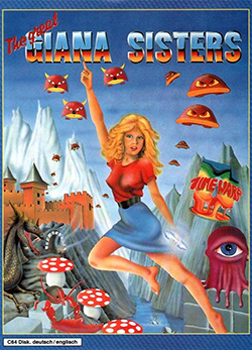 So much so in fact that Nintendo pressured the publisher into pulling The Great Giana Sisters from European store shelves in 1987. This of course has added to the game's mystique as a sought after collectible in the intervening years. And in this case, Nintendo's rabid protectionism of IP was perhaps not misplaced. 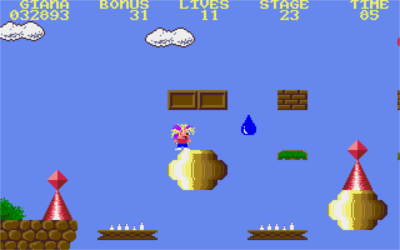 The Great Giana Sisters really does borrow liberally from Super Mario Bros. You start the game as a well-mannered girl in a school uniform (i.e. small Mario), but upon gaining your first power-up (attained by hitting a power block from underneath, natch) you turn into a punked up wild child with purple highlights in her hair (i.e. Super Mario). Soon you'll find another power-up that allows you to chuck fireballs. Worlds are structured in such a way that you venture through a variety of outside and subterranean levels before entering a vaguely familiar looking castle to face off with a boss. Bricks are smashable, enemies are stompable, etc. etc. Hell, the entire first level is almost a direct copy of the first level of SMB, right down to the placement of power-ups. I can only assume that Time Warp Productions figured they could slip this under the watchful eye of Sauron Nintendo unnoticed. But Nintendo did notice, and the rest is history. I've said this about other Mario clones, but it seems particularly pertinent here. Despite overwhelming structural similarities, The Great Giana Sisters doesn't have the same game feel as Super Mario Bros. I still maintain that if you're copying SMB this is where the focus should lie. 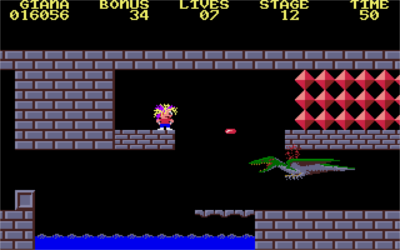 If anything The Great Giana Sisters reminded me a lot of Alex Kidd in Miracle World in terms of controls. Still that's not necessarily a bad thing in this case, as it does actually create at least a slight bit of distance between itself and its seemingly sole inspiration. Drifty jumps and rather sluggish movement are the order of the day here. I do need to make special mention of the music though, which is fantastic. There are only two songs, but they're both great. Having said that, I have to admit that I'm a bit of a sucker for the weird jingly-jangly space-disco synthesizer found in a lot of Amiga games. I suppose your mileage may vary in this regard. 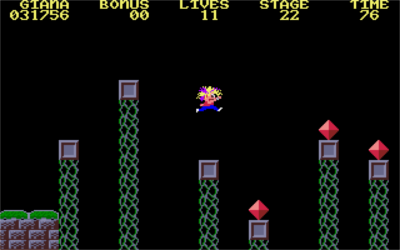 In some ways, it's too bad that The Great Giana Sisters never really made it out of the starting blocks during the 80's. It's not a bad game, and given the proper opportunity it really might have developed (much earlier) into a unique franchise in its own right. Does it approach the same levels of greatness of SMB? Oh God no, but that's not to say it's a bad game by any means. It's good, plain, unremarkable fun. Other than one particular late game spike in difficulty, this is an entry level platformer. 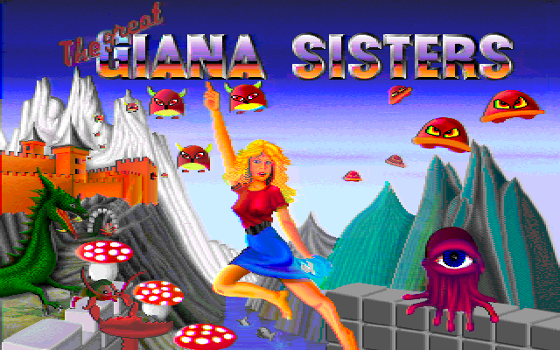 If you've beaten almost any other side-scroller from this era, The Great Giana Sisters should give you no trouble. Last edited by nullPointer on Mon Mar 05, 2018 6:47 pm, edited 2 times in total. I replay games frequently, and sometimes just cut and paste from old Games Beaten posts of mine. Nice job with Giana Sisters. I had fun with it several years back. The OST does indeed own. nullPointer wrote: Having said that, I have to admit that I'm a bit of a sucker for the weird jingly-jangly space-disco synthesizer found in a lot of Amiga games. I suppose your mileage may vary in this regard. It was really ahead of its time back in 1985, except for the hard panned channels.